What is the Académie Française? What do the letters AFP stand for? What was the Appel du 18 juin? Look no further, here are the answers to these questions, and to many others concerning French words, eponyms or names beginning with A.
AB - Agriculture Biologique - the AB label is a French certification for organic food products. The word "bio" or "biologique" are the French words for "organic", in the food and agricultural meaning of the word..
Académie : Word most commonly used to refer to the Local Education Authority in a French region, as in "L'Académie de Dijon", which is the local education authority for the Burgundy area. The director of an Académie is a senior civil servant known as the Rector (le Recteur). Académie Française. . The French Academy is an academy of letters, whose main function is to monitor and prescribe the development of the French language. It is one of the mostr respected of French institutions. Founded in 1635 during the reign of King Louis XIII, it is a self-perpetuating Academy of forty members, known as "les Imortelles". Academicians are elected for life by the other Academicians. The Acadamy publishes an official dictionary of the French language, but its opinions are not always respected even by the writers of official documents. In recent years, the Academy has been slow to adapt to the changes in the French language resulting from the influence of English and American, and of youth culture in general. It has fought a rearguard but generally unsuccessful action to preserve the French language from contamination by English; some successes have however been marked up, such as the replacement of "une pipeline" by "un oléoduc" (once the main word to describe a pipeline, "pipeline" has virtually disappeared from modern French), or - to a lesser extent - "hit parade", which now coexists with "palmarès". Acte de vente The official document, signed by all parties concerned, attesting the sale of a property. See buying property in France. Acte notarié A document of any sort whose authenticity is duly vouched for by the signature of a notaire (notary, or lawyer). Action directe: Left wing urban guerilla organisation responsible between 1979 and 1987 for a campaign of bombings and assassinations, including that of the former Renault boss Georges Besse; allied for a period with Germany's Red Army Faction. The group was always very small, with only a handful of active participants. ADSL - (Asymmetric Digital Subscriber Line) : the expression generally used in France to describe a broadband Internet connection or service. AFNOR -Association française de normalisation : the AFNOR is the French standards institute, and a member of the International Standards Organisation (ISO). It is responsible for determining French industrial standards, in line with European standards, and if necessary overseeing their application. AFNOR delivers certificates of conformity, allowing products to display the AFNOR label, the French equivalent of Britain's Kitemark. AFP - Agence France Presse: The main French press agency (like Reuter's in the UK or AP in the USA), providing raw news and information to the press and broadcast media in France and worldwide. AFP is the world's oldest established news agency, founded in 1835 by Charles-Louis Havas, the father of global journalism. Agrégation, Agrégé : The Agrégation is a competitive exam for the recruitment of a privileged category of secondary-school (high school) teachers in France, known as agrégés. The system was first introduced in 1766. The exam is open to candidates who are either already qualified secondary teachers, or else students who have already completed at least one year of postgraduate studies (a maîtrise or the first year of a masters). Each year, a number of places are made available in each of the subjects for which an Agrégation exists. There are always far more candidates than places, since obtaining the agrégation puts teachers or future teachers on the fast track to promotion, gives them less teaching hours than ordinary qualified teachers, better chances of getting a job in a top lycée, and in some though not all cases is a virtual prerequisite for applying for lectureships in French universities. Though the agrégation is specifically a qualification for the teaching profession, the competitive exam itself has little or nothing to do with teaching, being academic and research-based. Consequently, the system has been regularly criticized from within the teaching world as being outdated and inappropriate. In the disciplines of law and medicine, the agrégation is specifically a competitive exam for the qualification of university professors. Air France. The French national airline, which merged with KLM in 2007. The main operator of domestic flights in France, and one of the world's biggest international airlines. Alpes. The Alps, France's and Europe's highest mountain range. The summit of Mont Blanc, the highest peak in the Alps, is situated on the French-Italian border. The French Alps spread over two regions, Rhone Alpes in the north, and Provence-Alpes-Côte d'Azur in the south. Alsace, vins d'. Alsace wines, mostly white. 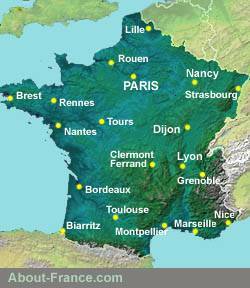 See the Guide to French Wines and Wine regions. AMF - Autorité des Marchés Financiers : Founded in 2003, the AMF is the watchdog body responsible for overseeing operations on the French stock exchange, la Bourse. The AMF resulted from the merging of the former COB, the CMF (Conseil des marchés financiers) and the CDGP. It was modeled on Britain's Financial Services Authority, though does not cover quite the same range of responsibilities as the latter. Amoco Cadiz Supertanker that ran onto rocks off the Breton coast in 1978, causing one of the world's major oil spillages. 1.6 million barrels of oil spilled into the ocean, and a lot of it ended up on the Breton coast. Amuse-gueule or amuse-bouche : more formally known as Mise en bouche : appetizer, small savoury pastry or delicacy presented usually with an apéritif or a pre-meal drink. ANPE Agence Nationale Pour l'Emploi - the former French equivalent of UK Jobcentres. Publicly run employment offices, the ANPE were merged into a new structure known as Pole Emploi at the start of 2009. AOP - Appellation d'origine protégée. See Appellation contrôlée, below. Antenne 2 the former name of what is now known as France 2, the main public television channel in France. Appel du 18 Juin - the most famous wartime speech made by General de Gaulle on 18 June 1940, calling all Frenchmen to arms in defence against the Nazi invader. The speech was given from London, on the airwaves of the BBC, and was widely printed and circulated in France from the next day onwards. It is generally considered to be the founding speech of the French Resistance movement. Appellation contrôlée (or AOC)… Quality label used to given to certain types of food or drink (notably wines and cheeses) that come from a specific geographic area, and are produced according to specific quality and quantity criteria. Since 2009, AOC labels are in the process of becoming AOP labels, Appellation d'Origine Protégée, following a shake up in wine classification affecting the whole European Union. Aquitaine The south west region of France, capital Bordeaux. It covers large parts of the historic provinces of Guyenne and Gascony, and stretches from Perigord in the north to the Pyrenees in the south. For more information see Aquitaine regional guide . Arc de Triomphe, Prix de l' the "Prix de l'Arc de Triomphe" is one of the four great events in the French horse racing calendar. It is a 2400 metre flat race, run each year at the racecourse at Longchamp, just outside Paris, on the first Sunday in October. Argus, L' : Famous French car magazine, listing the resale prices of used cars. The "côte de l'argus" is used as a benchmark when buying or selling a used vehicle. Armed forces. Since the phasing out of conscription in 2001, the French armed forces have become fully professional. In 2001, the total manpower of the French military was 516,112 people, 216,538 of them in the Armée de Terre (the land army), 70,802 in the Armée de l'Air (the Air Force), and 59,450 in the Marine Nationale (the navy). The total figure also includes 100,358 men and women in the Gendarmerie, which, though a police force, is considered as one of the armed forces in France. A further 65,964 people were employed in general military support and social services. Arrêté, un : An arrêté is an order, a decree or a by-law, signed by someone in power, such as a minister or the head of some level of territorial authority. An arrêté préfectoral is thus a by-law or order, signed by the Prefect, and applying to some issue, location or activity under his jurisdiction. Arrondissement. The word used to define the administrative districts of the major French cities, notably Paris, Lyon and Marseilles. The city of Paris (that is Paris within the limits of the old walls and the modern boulevard périphérique) is divided into 20 arrondissements, numbered clockwise and in concentric circles from the centre. Probably the two most famous arrondissements are the fifth, containing the Latin quarter and the Sorbonne, and the sixteenth, the most affluent district of central Paris. Each arrondissement has its local council and its mayor, as well as its town hall or hotel de ville. Article 49.3 Controversial article in the constitution of the Fifth Republic (the current French constitution), allowing a government to push unpopular measures through pariliament without a vote. In 2008, President Sarkozy introduced a constitutional reform which, among other things, limited the scope of application of this article. Assas Name popularly used to refer to the University of Paris II. Paris II was created in 1968, when the big University of Paris was broken down into constituent elements. Assas is principally renowned as France's main law school, though it also offers courses in business, politics and economics. Its students have a reputation of being rather conservative. Former students include President Mitterrand, and former prime ministers Michel Rocard, Jean-Pierre Raffarin and Dominique de Villepin. ASSEDIC Associations pour l'emploi dans l'industrie et le commerce : Organisations responsible for collecting unemployment benefit contributions from employers, and distributing unemployment benefit to claimants. ASSEDIC are also responsible for overseeing the management of unemployment in France, and the training of job-seekers. Since January 2009, the ASSEDIC has been merged with the ANPE. Assemblée Nationale. The principal French legislative assembly, also referred to as the Chambre des Députés. The Assembly is made up of 577 deputés, members of parliament who are elected by direct universal suffrage during legislative elections that take place every five years. In the event of disagreement between the National Assembly and the Senate, it is the opinion of the Assembly that takes precedence. Assermenté (adj.) : literally sworn in. Adjective describing an official or individual who has taken an oath of office, or been sworn in. Foreigners in France may sometimes need to provide certified translations of official documents from their country of origin. These must be translated into French by a state recognised translator, who has been sworn in as a translator, and is known as a traducteur assermenté. Association loi 1901 The official French definition of a duly constituted and registered non-profit organisation, as specified by a law on non-profit associations passed in 1901. Astérix No doubt the most famous French cartoon character, first created in 1959 by writer René Goscinny and illustrator Albert Uderzo. Asterix, a small but determined Gaul, first appeared in the French comic Pilote, and the first of the popular albums came out in 1961. Over 30 albums have been published, and several films made; Asterix books have been translated into over 100 languages, including Latin and Ancient Greek. Set in Roman times, the albums tell of the adventures of Asterix and Obelix , a joyous Laurel-and-Hardy type pair of heroes who lead the resistance of the ultimate Gaulish village that refuses to bow to the Roman occupier. The stories can be read on many levels, are witty and full of inuendo, and thus appeal to readers of all ages. Astérix, Parc. Amusement park north of Paris, devoted to the cartoon character Astérix and his friends. Aubry, Martine. b. 1950. Daughter of Jacques Delors, Martine Aubry is a French socialist politician, elected as leader of the Socialist Party (PS) in November 2008 after a fierce contest with her centre-left rival Ségolène Royal. As minister of employment in the Jospin government from 1997 to 2000, Aubry is best known for having introduced the statutory 35-hour working week into French labour law, a move heavily criticized by her political opponents, as having severly damaged France's international competitiveness and thereby boosted unemployment rather than reducing it. Though the Jospin government to which she belonged was committed to getting rid of "cumul des mandats", Aubry in early 2009 was simultaneously first secretary of the Socialist Party, Mayor of Lille, and president of the Lille metropolitan area. As leader of the PS, she has been much criticised from within, firstly for her very narrow margin of victory in the leadership contest (50.04%), secondly for being a "three-day-week" leader of the PS (the rest of the week being devoted to her functions in Lille) and thirdly for leading the party to its worst electoral score, in the 2009 European elections, where the Socialists obtained under 15% of the vote, just a short way in front of the Green party. Since the Strauss-Kahn affair rocked the Socialist party in 2011, Aubry was one of the two main contenders for nomination as the PS's candidate in the French 2012 Presidential election - the other being her predecessor the more social democratic François Hollande. Since Hollande's election she has taken an unofficial role as head of the left-wing opposition within Hollande's own Socialist party. Auchan One of the main French hypermarket chains, owned by the Mulliez family. Austerlitz, Gare d'. The principal Paris railway terminus serving routes to the south west, a segment stretching from Toulouse to the Loire Valley. A significant proportion of long distance express traffic was removed from the Gare d'Austerlitz from 1989 onwards, following the opening of the south western TGV line, that terminates at Gare Montparnasse. Austerlitz is the name of one of the famous military victories of Napoleon, in 1805. Autoentrepreneur. New business structure introduced in 2009, to encourage entrepreneurship in France. The system has proved even more successful than predicted, and hundreds of thousands of people signed up for the new status in the first six months. The great attraction and innovation of this system is its simplicity. In the past, setting up as a sole trader or self-employed in France was a very complex formality, involving registration with at least three different organisations (depending on the nature of the work), for tax , social security and health service benefits; it was also fiscally heavy, with high contributions to the various "caisses", bearing no relation at all to actual earnings during the first two years. The new "statut de l'autoentrepreneur" has done away with all this; signing up is a simple process, done on line, and those choosing this status have one single periodic payment to make, covering all their social security and health contribution charges, and even income tax. Payments are strictly based on actual earnings, so a self employed person who earned only 10 Euros in a poor month now pays his social security charge as a proportion of the sum actually earned. There are three contribution rates , depending on the nature of the activity, sales, services or professional consultancy. Anyone can sign up for this new status, which covers not only the self employed, but also those who have a job with an employer, but also wish to undertake entrepreneurial activities as a sideline. A secondary advantage of this new system has been to bring into the system people who previously did the odd job on the side here and there, but never declared these earnings, on account of the complexity and expense of the previous systems..
Avignon, Festival d'. The most important theatre and music festival in France, founded in 1947 by Jean Vilar. Like the Edinburgh Festival in Scotland, the official Avignon Festival, which takes place each year in July, is now surpassed in size by its Fringe, known as the "Off". Avoriaz, Festival de film d' Annual cinema festival, focusing on the Fantastic, which took place at Avoriaz, in the French Alps, from 1973 to 1993.